Marie-Louise Fébronie Meilleur (née Chassé; August 29, 1880 – April 16, 1998) was a French Canadian supercentenarian. Meilleur is the oldest validated Canadian ever and upon the death of longevity world record holder Jeanne Calment, became the world's oldest recognized living person. She was succeeded as the oldest living person by Sarah Knauss. She was born in Kamouraska, Quebec, where she married her first husband, Étienne Leclerc, at age 20 in 1900 who was a fisherman. Étienne Leclerc died of pneumonia on February 24, 1911, aged 39. Her father died on June 25, 1911, aged 61. Her mother died February 23, 1912, aged 59. Meilleur left two of her four surviving children in 1913 and moved to the Ontario border to help support her sister, whose children were sick with diphtheria. She returned to the Quebec region in 1939, She had six children by her second husband, Hector Meilleur, whom she married on October 25 1915. All of her children moved out by 1942. Her second husband Hector Meilleur died in 1972, of diabetes at age 93. From there she lived first with a daughter and then in a nursing home in Corbeil. Out of her twelve children, only four survived her. She had 85 grandchildren, 80 great-grandchildren, 57 great-great-grandchildren, and four great-great-great-grandchildren. Meilleur smoked tobacco into her nineties. She quit smoking aged 102 in 1982 when she caught a cold. In 1986 when asked the secret to long life she said hard work. Hard work never kills a person. 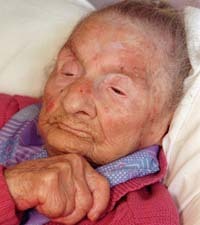 She became the oldest living person in August 4, 1997, after the death of 122-year-old Frenchwoman Jeanne Calment. Around her 117th birthday she was too weak to talk and she could only hear if someone shouted directly into her right ear. Marie Louise Meilleur died of a blood clot at age 117 in April 1998 in Corbeil, Ontario, one of her sons was also living in the same nursing home, and her oldest living daughter, Gabrielle Vaughan, was ninety years old. Gabrielle died in 2004 aged 96. Meilleur was buried alongside her second husband in Swisha, where she had previously lived. ^ Jeune, Bernard; et al. (May 2010). "Jeanne Calment and her Successors.". In Maier, Heiner (ed.). Supercentenarians (Demographic Research Monographs). Springer. pp. 295–298. ISBN 978-3-642-11519-6. ^ "Marie-Louise Meilleur, 117; Listed as Oldest Person in World". Los Angeles Times. Associated Press. 1998-04-18. Retrieved 5 December 2018. ^ Jr, Robert Mcg Thomas (18 April 1998). "Marie-Louise Meilleur, 117, And Felicie Cormier, 118". The New York Times. Retrieved 11 May 2016. This page was last edited on 2 April 2019, at 00:41 (UTC).